Ford to expand lineup bringing award-winning EcoBoost 1.0-liter three-cylinder engine to U.S.
DEARBORN, Mich., Nov. 19, 2012 – Ford’s highly successful, fuel-efficient EcoBoost® engine technology hit a big milestone recently with its 500,000th engine being produced just three years after its launch in 2009. The 500,000th engine was fitted into a 2013 Ford Escape that rolled off the line at Ford’s Louisville Assembly Plant. The milestone is another step in the One Ford plan to be the undisputed industry fuel economy leader, with more segment fuel economy leaders than Toyota or any other manufacturer. By the end of next month, customers will be able to choose eight Ford-built vehicles that deliver 40 or more miles per gallon — double the number available last year and more than any other automaker. Ford also recently introduced the world’s most fuel efficient mid-size sedan with the Fusion hybrid, rated at 47 mpg city, 47 mpg highway and 47 mpg combined. The C-Max Hybrid is also rated at a combined 47 mpg, which beats the Toyota Prius v.
When EcoBoost launches on Fusion in South America early next year, the fuel-saving engine technology will be available in every region Ford serves. In North America, EcoBoost sales make Ford the leader in gasoline turbo direct-injected engines in its core high-volume passenger vehicles, such as Escape, Fusion and F-150. Ford’s global EcoBoost engine family includes the award-winning 1.0-liter three-cylinder, 1.6-liter and 2.0-liter four-cylinder engines, and the powerful 3.5-liter V6. EcoBoost was introduced in July 2009 with the 3.5-liter V6 EcoBoost engine in the 2010 Taurus SHO; 9,946 units were sold that year. 2010 saw EcoBoost sales increase to 15,117, while last year Ford sold 127,683 EcoBoost-equipped vehicles in the U.S.
By 2013, more than 90 percent of Ford’s North American lineup will be available with an EcoBoost engine. Today, Ford offers EcoBoost engines in 11 North American nameplates, with four more coming in 2013. Engine control software the key Ford’s powertrains use hundreds of thousands of lines of computer code and related parameters that are adjusted to optimize the engine and transmission operation. It’s these processes that largely make up the EcoBoost patent contribution, and make Ford’s use of direct injection and turbocharging of its engines like no other automaker in the world. Ford holds more than 125 patents on its EcoBoost engine technology, which uses turbocharging, direct gasoline injection and variable valve timing to boost fuel economy by about 20 percent without sacrificing performance. Escape and Fusion sales get turbocharged The Ford Fusion and Ford Escape exemplify the trend at Ford of putting the technology to work in the most mainstream, high-volume vehicles. Fusion production will go from 0 percent EcoBoost-equipped for model year 2012 to 60 percent turbocharged EcoBoost for 2013. The new Escape features two EcoBoost engines, a 1.6-liter and 2.0-liter that will make up 90 percent of its expected sales volume. 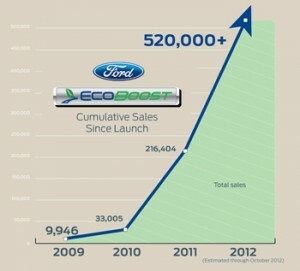 In Europe, EcoBoost is beginning to build momentum as well. Ford plans to triple the production of its vehicles equipped with EcoBoost engines to approximately 480,000 in 2015, from 141,000 last year. More than 300,000 of that projected yearly output will be vehicles equipped with the new 1.0-liter EcoBoost. “With the sharp increase in EcoBoost production in the Fusion and Escape – on top of the F-250 Super Duty Power Stroke® diesel – Ford will have the best-selling turbocharged sedan, SUV and pickup truck in North America,” said Robert Fascetti, director, Large Gas & Diesel Engine Engineering. The limits for radical engine downsizing are undetermined. Ford plans on continuing to offer EcoBoost engines globally, including some innovative downsized engines. Ford has announced it will bring its award-winning EcoBoost 1.0-liter three-cylinder engine to North America next year. After launching just this year, the Focus 1.0-liter EcoBoost has already achieved nearly 30 percent of European Focus sales.